This item has great features. This lightweight tool has a nail puller, hatchet edge, saw edge, hammer, wrench with 3 different sizes, and a bottle opener. A water filled compass is located at the bottom of the handle. The compass can be unscrewed revealing a waterproof container. Inside the waterproof container you will find a box of matches, 2 nails, a sharp razor blade, fishing line,sinkers, and hooks. 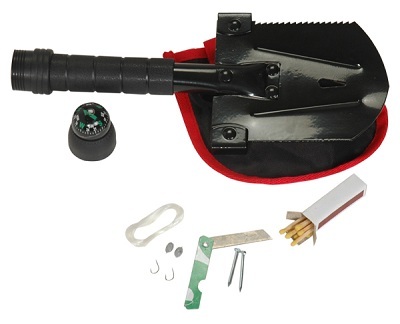 This is a great tool to keep handy in survival kits, home, car or boat.